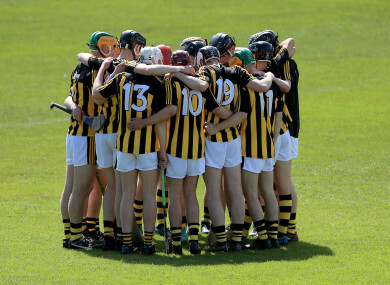 Kilkenny players form a huddle before their Round 1 clash with Dublin back in May (file pic). THERE WERE EMPHATIC wins for Dublin and Kilkenny on Saturday afternoon, as both counties joined Wexford and Offaly in booking their place in the Electric Ireland Leinster Minor Hurling Championship semi-finals. The Cats put Westmeath to the sword with a one-sided 5-28 to 1-5 victory, while Mike Connolly’s Dubs defeated Antrim by 24 points in Dowdallshill. Wexford beat Kildare by 15 points to set up a final four clash with Dublin, meanwhile Offaly came out on top 2-19 to 1-14 against Laois in Tullamore. They will now face Kilkenny on 23 June. Email “Kilkenny and Dublin each record landslide wins to book Leinster minor semi-final spots”. Feedback on “Kilkenny and Dublin each record landslide wins to book Leinster minor semi-final spots”.